Portuguese Football manager who has managed Porto, Chelsea, Inter Milan, Real Madrid and Manchester United. When you are seeing him beside Maradona, you can already know that the 174 listing is too low. This guy is very Portuguese and I can't see him being 176cm tall. Those shoes in that pic do not have a natural angle at all. He is almost certainly 174cm at a low but is wearing small lifts most of the time. Mourhino is 177. He does pull off a 5'10 impression with other people and doesnt look more than 3 cm shorter than 5'11 Pep. Now look at the pic I posted of Maradona with Mourinho, the one where you can see their feet. Could you add Josep Guardiola? He's arguably the best manager in the world. Rob what's your guess on guardiola's height? Google says he's 5'11(180cm). Do you agree? Rob when you say his height is 176cm you mean his peak during the day? I mean generally about all the heights. @Editor Rob: He manages to pull off a 5'10 impression with a couple of celebs. Would you consider a 5'9.5 upgrade? Would say Jose is a stronger 5'9", doubt he falls under the mark by much at night, maybe half a cm at most. Always looks anywhere from 174 cm-177 cm. Rob, what determined you to list him as 175 cm? I'm not saying you're wrong. He's a tricky one to pin down! He's looked taller than this with many people - more so, than most other 175 cm listed guys. Those saying 5' 8" or shorter are way off! Editor Rob: that's just the feeling I got from looking at him. He doesn't look over 5 ft 9 with Rio Ferdinand. 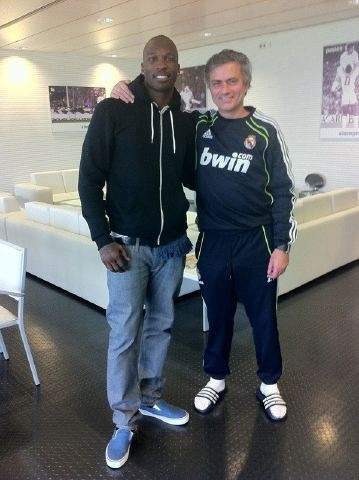 I would say Jose is 176 cm; about 5' 9.25". @sa, you have a funny yet valid point. He literally grows and shrinks. I don't get it. sometimes he looks akmost 180cm, but sometimes closer to 170cm, maybe he is reptiloid? @Tarik People usually don't notice or give a damn unless the difference is like around 5 cm or more (in terms of lying about your height, lets be honest that most people say that they are taller and not shorter than they are XD). I guess you claiming anything about 175-177 cm would be fine anyway. I hardly know any job in that you require a height measurement these days though. @Tarik People usually don't notice or give a damn unless the difference is like around 5 cm or more (in terms of lying about your height, lets be honest that most people say that they are taller and not shorter than they are XD). I guess you claiming anything about 175-177 cm would be fine anyway. I hardly know any job that you require a height measurement these days though. but seriously, I think you are probably going to drop down to 175.5-6 range, but I doubt anybody is going to be bothering if you said 177 or 176. How tall do you think his son is? He was a youth goalkeeper for Fulham Fc I have heard. Editor Rob: he could be nearly Jose's height now. Rob, unless Jose is a lift wearer, I'd say 177 cm actually looks closer! You seen him with Robbie Williams or Gary Lineker for example? Or with Arsene Wenger? 175 cm could be undercooking him a little. He's looked as close to 5' 10" as he has to 5' 9" on many occasions. how is he taller than Nishikori? Rob i think mourinho in fact is 177 cm slightly taller than 176 wayne rooney and almost the same as cesc fabregas who is 5ft10 so What do you think Rob?? @Johnson Take under consideration that Kaká was listed as 185.6 cm and Cristiano as 186.5 cm, when Cristiano is shorter than Kaká. So this measurements are not completely reliable. I would be even skeptical of the 181.5 cm range for Casillas. Either he was measured in shoes or he was standing on tiptoe. 181 cm flat maybe... But a weak 182 cm? No way! The difference between him and Ramos is too big. Does he use lifts sometimes? 5 foot 8. May be 173.5 - 174 cm. Me: 171 cm barefoot. Looks 1cm less than Wayne Rooney, with Mourinho in dress shoes and rooney in football boots. Rooney is confirmed 176cm, so 174.5cm > 175cm seems right for Mourinho. A weak 5'9 or strong 5'8 either way. Editor Rob: he's not losing that much, about half inch I'd have said. I think Xabi Alonso is 182,5cm (weak 6') and Casillas is 181 cm. Rob Is it me or does Mourinho look like he's wearing lifts in his shoes in the foto up top? Editor Rob: I wouldn't have said so, but then some sneakers might have a slightly more angled lace section than others. Are you still convinced that Casillas is a legit 182 cm? Xabi Alonso is taller than Casillas near 1 inches. Regardless whether Mourinho is in the 174-176 cm range, that video with Anthony Joshua shows just how massive a legit 6'6 guy can look. Jose looks like a little boy in that clip. Its funny in the beginning of the clip when Joshua is running to meet Mourinho, those two guys next to him are even taller than he is! Must be security or part of his entourage. @Johnson Xabi Alonso is around 182 cm flat, only a bit taller than Casillas. He never looked outside 174-177 cm or 5'8.5-5'9.5. I would say 175 cm / 5'9 if not 176.5 cm/ 5'9.5. Jose is ****ed up. He can look even as 170 cm, and sometimes even more than 177 cm. If he is taller, why he claims to be 1,74m ? He doesn't seem to be a guy who wants to appear small (short). One of the strangest guy ever, hard to estimate his height. I suppose a comparison with Wayne Rooney - who is a classic 5' 9" (175 cm) guy, would answer this one, Rob. Imo he is somewhere between 174-175. Not sure if as low as 173cm. I agree, 174.5 cm maximum, although 174 minimum. Click Here photo with an Inter legend- Zanetti, who is 178 cm. I am an Inter fan, so I know him quite a lot. He is wearing sometimes internal lifts or high shoes, sometimes not. It is why he may sometimes appear taller, sometimes not. I was in Appiano Gentile in the open training and his eyes were in the same height as mine, and I am 174 cm in the afternoon. As Andy says, he is no doubt 174, but 175 is a little too much. 174.5 is accurate. Editor Rob: actually see him with 6ft 1 Chad Johnson, I would be surprised if only 5ft 8. Good listing Rob. Do you think he might wear slight lifts during events or match time? I have noticed that the angle of his feet is higher like it's visible in the above photo. Rob, since He's 5'9 does that make Pep Guardiola near 5'10.75?